Whether it is to cripple the will of Putin and end his support of the Syria regime (thus handing the much desired gas-pipeline traversing territory over to Qatari and/or Saudi interests), a hypothesis first presented here in September and subsequently validated by the NYT, or much more simply, just to destroy any and all marginal producers so that Saudi Arabia is once again the world's most important and price-setting producer and exporter of oil, one thing is clear: the Saudis will not relent from pumping more oil into the market than there is (declining) demand for, until its biggest threat and competitor - the US shale patch - which recently had become the marginal oil producer, as well as its investors - mostly junk bond holders gambling with other people's money - are crushed, driven before the Saudi royal family, and the lamentation of their women is heard across the globe. But what neither the Saudis, nor the US shale companies, and certainly not their investors who lately seem to get their investment advice from the no longer Nielsen-rated Financial Comedy Channel, know is even if every last US shale company is Friendo'ed, there is an even more insidious group of drillers and oil extractors behind them, backed by an even greater monetary bubble and an even more clueless group of sources of cash, just waiting to step in and become the next marginal oil producer. According to Global Times, the slump in oil prices "has triggered a flurry of Chinese investment in oil wells, in a bid to get a high return from the black gold." According to the company, the project, involving six oil wells in an area of 2,240 acres, is located in Crockett County in Texas. Cooperating with local developers, the project is expected to attract a total of $4 million investment at the first stage, with the minimum investment of $100,000 each. The annual return could reach more than 12 percent, the company said. Or, if Chinese sources of funding rush in to maintain oil supply at its current levels, or even boost it, into a world where demand is plunging (and, poetically, driven by a plunge in demand out of China itself), that annual return could reach 0, -12% or, most likely -100% as yet another series of investors with hot central bank money is wiped out. Of course, nobody ever anticipates lower prices: "The return is based on our prediction of future oil prices," Liu Bin, general manager responsible for the US investment at Global House Buyer, told the Global Times on Saturday. Liu predicts that the current oil price still has room to rise, which will generate higher profits for the project. What Liu seems to be unaware is that the current low price of oil which enables him to find investment opportunities in the Texas shale is precisely due to supply and demand being where they are, and unless supply collapses to keep up with dropping demand, oil prices will never go up. But why bother with the details. For now Liu, and many of his competitors, is merely eager to demonstrate his ability to generate 12% returns on the back of a surging price driven by... his incremental pumping? According to Liu, the oil wells have been in operation since 2012. Currently, the total output per day is about 170,000 barrels, and they still have more than 10 years of drilling capacity with a stable output. "Investing in the oil wells could be read as another sort of real estate investment," Shi Ruixue, CEO of Global House Buyer, said. "Chinese investors have gained more experience about risks after the financial crisis in 2009. It is a good timing to invest in oil projects as the prices are still low. But if the prices move further down, it will pose risks to oil investment," Lin Boqiang, director of the China Center for Energy Economics Research at Xiamen University, told the Global Times on Sunday. He Shaohua, a potential investor who has invested in housing projects in the US, told the Global Times that he planned to invest $100,000 in the oil wells, as it is good to diversify his investment. In other words, just as US junk bond investors in energy companies swear to never repeat their mistake again, at least those who still have "other people's money" to invest, here comes the next patsy, one who has just as deep pockets if not deeper, and who will assure that the US pumping action does not stop for a very, very long time. We hope we don't need to explain happens to the price of oil as China storms in to restart the deserted US shale rigs. However, one thing we can't wait to find out, is just how will China react when it learns that just as it was preparing to celebrate, that it will need to deal with yet another marginal source of production (and funding), one who will surely engage in output competition for the next 12-24 months, until the latest batch of hot money, just off the central bank printer, runs out. Oil’s Rally: Short Squeeze Or Sustainable? Has Saudi increased production since US started shale development? NO. Saudi was in the market as usual, US came into market and increased global supply. It is ridiculous that some put the blame on Saudi's effort to cripple US shale economy. I'll give you a B+ for 11th grade creative writing and a F for being factual. The average cost per barrel for shale is around $44, and that means that some areas are higher, and some are lower - even as low as $29. We're seeing a cutback in rigs, but U.S. oil production continues to increase. "Fracking" is simply an evolution of drilling techniques that have occurred over decades and it continues to evolve. Drillers continue to share successful approaches, are utilizing big data, improved technology, and hard-working American workers to get more oil out of the ground. Fracking is getting cheaper, not more expensive. Depending on the price of oil, some more rigs will shut down and shale production will suffer but to say it will be "crushed" is just absurd. Fracking has created a permanent "ceiling" on the price of oil protecting us from OPEC, which is now a paper tiger. All oil and gas production reduces the supply of oil and gas!! The rate nature produces oil and gas is no faster than one thousandth the rate they are extracted and burned, never to be returned to oil or gas in the lifetime of the United States of America, unless the USA will be celebrating the one millionth 4th of July some one million years in the future, rather unlikely given no nation or civilization has lasted a thousand years. What China will be buying is oil and gas in the ground and operate these properties to pay for the oil and gas that China must import. If China must operate these fields at a loss to keep the price of oil way down, China will profit from the low price on the far higher volume China must pay to import the oil it needs. 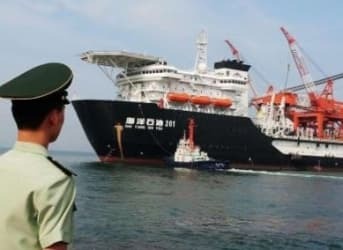 For China, losing money producing 100,000 barrels of marginal oil to drive the price down to and keep it at $30 instead of rising to $40, then China will pay $10 per barrel less for the ten million barrels of oil it must import to keep peace in China. What Zerohedge seems to have is zero understanding of the Chinese. As pulp pointed out, first off, when the Chinese invest in resources, they want the resources and care about little else. The other thing that most in the west fail to grasp is that the Chinese do not see long term and short term investments in the same way we do. What we see as long term, they would see as short term. Long term to them is multi-generational. So not being able to turn a profit in the next few years means nothing to them. Sadi oil is not cheep it should be taxed at $50.00 a barrel as soon as it leaves Sadi waters or as soon as it gets to US port the tax should be used to pay down US debt caused by the war effort in the Middle east this would make shale oil worth $80.00 per barrel in the US it would take money away from isis and they would fall end of problem. Big oil and Saudi Arabia are working in concert to damage both Russia and small US producers.